For the last 60 – 70 years the a garage sat on the south side of the home built at 205 Crichton Street in 1945. For the first few decades of its existence the building provided storage for vehicles while blocking views from the home of the former railway lines that ran where there is now a recreational pathway. Deterioration of the building’s structure (i.e. rusted steel beams in the floor over a crawlspace, rotten wood roof joists, cracked cinder block walls) now makes the building unusable and unsafe. The time has come for its elements to enter the waste processing stream and be repurposed as something else. The vast majority of the construction waste in the City of Ottawa is now diverted from landfill. Up to 97% of the materials salvaged during a building’s demolition are now processed and reused. 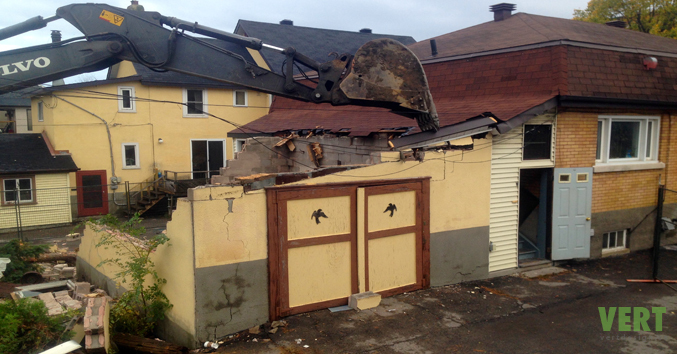 When thinking about demolition, most people envision explosions, dust, piles rubble, and big machines. Instead of chaos on a grand scale, demolition is actually a very slow surgical process. This video shows the care taken by the operator of the excavator working on the deconstruction of the garage to separate materials: wood and metal moved toward the centre of the garage; glass and masonry toward the outside. I sometimes joke that a really good operator could butter a piece of bread with the tooth of his bucket. This really isn’t far from the truth.